Doesn’t our government have better things to do? Our government has many important issues to deal with; however, government is also expected to be able to deal with multiple issues at any one time. The Anthem belongs to Canadians. It is up to us to bring about change. We don’t need the Government to legislate how we sing our National Anthem. Where do you stop when it comes to change? In our opinion, change never stops and Canada never stops evolving, nor should it. The question shouldn’t be, “where does it stop?” but rather “where does it start?”. An amendment of the word sons in our National Anthem is one that is not meant to alienate, but rather incorporate, every person in this country who identifies themselves as Canadian – a definition that has changed significantly over the years and will continue to do so. Canada is a Canadian symbol and we have history for a reason? We agree. But we also recognize that the National Anthem is a living document much like many of the other symbols of Canada that have been amended over time to reflect present day. O Canada is something that represents our country on a global scale and should therefore be inclusive and indicative of our population and our attitude towards them. Restoring the anthem to reflect its original version is the simplest way to encapsulate the equality of all Canadians. There are much larger women’s issues at hand, why place attention on this? We strongly believe that issues do not need to be dealt with one at a time. Every small win for equality contributes to a larger goal to fully establish women as equals in Canada. Our support of this issue does not come at the sacrifice of other women’s issues but rather in support of them. Gender equality has been achieved, why stir the pot? Because women do not face the same struggles as women of the past, it is often perceived that gender equality has been achieved. In actuality, women are still facing gender equality issues every day. Our National Anthem should reflect what women of the past fought for and like them, we should not settle for the status quo, but rather continue paving the way towards an inclusive Canada. The national anthem isn‘t supposed to be taken literally. Ex. ’mankind’ represents everyone? We have a feeling if the word was ‘daughters’ it would be taken literally. At the end of the day, we are hoping to amend two words of our anthem to paint the picture of a national who views all genders as equals. Won’t there be a lot of cost associated with this change? Any historical copies of O’Canada would remain. 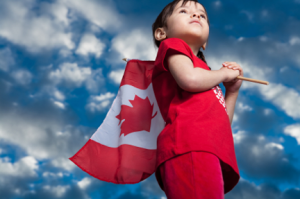 Currently, the anthem is available on the Canadian Heritage website and any official re-printing costs for materials provided to schools or other organizations would be very minimal. For the most part, lyrics to O’Canada are displayed digitally on government sources or for broadcast at events. "in all of us command" was never in any of the original lyrics, why are you proposing we use these words? The lyrics we are proposing, ‘in all of us command’, are very close to the original version, ‘thou dost in us command’ and have the same meaning. However, the words have been updated to current English proper. The proposed change also reflects previous recommendations of amendments raised in 1986 and 2002. Why the change from ‘Restore Our Anthem’? Like our anthem, our webpage, and message, has required updating from time to time. The anthem belongs to Canadians and we encourage everyone to choose to sing the anthem that they think best represents Canada. We are not asking to sing the original lyrics, we are looking forward and asking Canadians to join “all of us” in singing the Anthem that reflects our national values. Has the Anthem ever been changed before? Yes, several times! The English version of O Canada, has had a long evolution and seen many changes. Judge Weir, the author of the original poem amended the original 1908 version in 1913, 1914, and 1916. In 1927, the Government of Canada authorized Judge Weir’s song to sing in schools and public functions with further amendments to the words. Again in 1980, when the National Anthem Act was passed, the words were changed to the version we now sing.